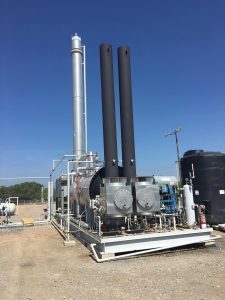 An existing customer in the Eagle Ford shale drilled and brought a new well on with a higher flow rate of C02 than wells currently being treated. 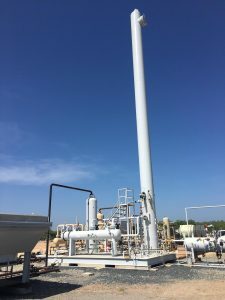 This customer prefers TransTex Treating equipment because of its reliability and our expert service, so they decided to upgrade from a 10 GPM to a 25/30 GPM Amine plant. This gave them greater efficiencies, with the ability to upgrade and treat the new well with the appropriately sized unit. This upgrade required proficient project planning by the TransTex fabrication facility and installation teams. The equipment was delivered on February 26th and the well start-up and commissioning was on March 1, 2018.